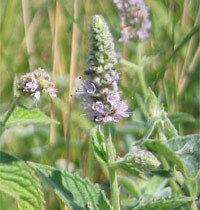 Mentha pulegium or Pennyroyal is a much debated mint species, which is said to be safe in limited amounts. The tea can be used for ingestion (though there are much safer alternatives! ), or to stimulate menstrual flow, but it is best known for its ability to induce abortion, however there is a case in which prolonged usage led to death. Mints are generally good insect repellents and insecticides, but due to the additional toxicity of pennyroyal, it is even more suited as an insect repellent. 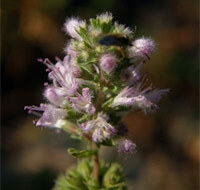 But, do not use pennyroyal as a flea repellent, because it is toxic to pets, even in small amounts. Pennyroyal essential oil is highly toxic. Even small doses can be deadly. Mentha x piperita or Peppermint is a hybrid mint, or more specifically, a cross of watermint and spearmint. Peppermint contains B vitamins, calcium and potassium. It is rich in menthol, which acts as a local anesthetic and also has analgesic properties, so it acts as a painkiller. Like most mints, peppermint is a very good antipruritic and a natural insecticide. Peppermint tea is traditionally used to treat diarrhea, vomiting, flatulence and Irritable Bowel Syndrome (IBS). Peppermint, administered topically, is used for tension headaches, applied to the forehead and temples. Peppermint tea is safe to drink. Peppermint contains pulegone, a toxic organic compound, which is neutralized when cooked. The toxicity of peppermint is still being researched. "Everything is poison, there is poison in everything. Only the dose makes a thing not a poison." Poisoning is a serious physical condition produced by a substance (toxin, venom, or other poison), which causes a disturbance in an organism (human). In severe cases of strong poisoning the outcome can be deadly. For immediate cleansing and gastric decontamination take activated charcoal. Some plants, which are commonly used for food, have poisonous parts. There are many poisonous plants worldwide. The following is only a short list of plants that we, humans, commonly use for food, and by no means a complete list of poisonous plants. Apple (Malus domestica). The seeds contain cyanogenic glycosides. The amount of seeds in a single fruit usually won't kill a person, but if a high dose of seeds is ingested, it can be fatal. Cassava (Manihot esculenta). Toxic while in unprocessed form. Cherry (Prunus cerasus) & (Prunus spp), peach (Prunus persica), plum (Prunus domestica), and apricot (Prunus armeniaca). Leaves and seeds contain cyanogenic glycosides. Indian pea (Lathyrus sativus). A legume grown and valued in Asia and East Africa for its reliable growth. The seeds contain a neurotoxin causing wasting and paralysis if eaten over a long period. Kidney bean or common bean (Phaseolus vulgaris). Contains the lectin phytohaemagglutinin, which causes gastric upset. The toxicity is removed thorough cooking. Nutmeg (Myristica fragrans) contains myristicin, a naturally occurring insecticide and pesticide. Lima bean or Butter Bean (Phaseolus lunatus). Raw beans contain dangerous amounts of linamarin, a cyanogenic glucoside. Potato (Solanum tuberosum). Foliage is toxic, containing the glycoalkaloid solanine, which develops as a result of exposure to light. Causes intense digestive disturbances, nervous symptoms, and in a high enough dose, death. Rhubarb (Rheum rhaponticum). Leaf blades, but not petioles, contain oxalic acid salts, causing kidney disorders, convulsions, coma. Rarely fatal. Tomato (Solanum lycopersicum). The foliage and vines contain alkaloid poisons which cause digestive upset and nervous excitement. Onions and garlic (genus Allium) contain thiosulphate, which is toxic to dogs, cats and some other livestock, if taken in high doses.